Americans getting news has changed. More than ever, Americans are getting their news from online sources. A Pew Research Center study in 2017 found that 43 percent of Americans get news online, which according to the same report, is just 7 percentage points below those who get their news from the television. By a lesser margin, Americans — some of these the same Americans who get their news from TV or online — also get their news from the radio at 25 percent or print at 18 percent. What’s amazing about this research is the narrowing of the gap between television and online sources from 2016 to 2017 in how Americans get their news. In 2016, Americans, some of whom still get their news from multiple sources, consumed news at these respective percentages: television 57%, online 38%, radio 25%, and print 20%. The gap between television and online narrowed by more than half within one year. Who is to say what the percentages will be next year? Will online news dominate television, radio, and print news sources? Needless to say, these online news statistics prove what we already knew: Americans are increasingly using the internet for news, even if some Americans use other news sources, too. 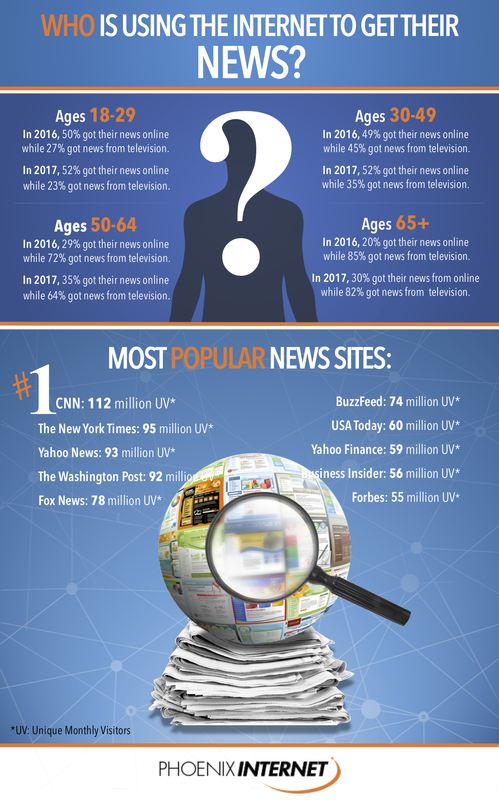 Who is Using the Internet to Get their News? Americans from all backgrounds, ages, socio-economic income levels, ethnicities, and gender use the internet for multiple purposes, and one of those purposes is obtaining news. According to the same Pew Research Center data, there is a stark difference in age groups who get their news online. This directly reflects generations who grew up with the internet versus generations who grew up with the television. All the same though, even the older generations still receive some news about the world from online sources. U.S. news sites are not the only place where Americans get their news online. They are also getting it from social media. Returning to the Pew Research Center but another study from 2017, nearly two-thirds of Americans get at least some of their news from social media sites. In 2016, 62% of all Americans got some of their news from social media: 18% said they hardly ever read news from social media sites, 26% said they did sometimes, and 18% said they did often. Meanwhile, in 2017, 67% of all Americans said they got some news from social media, and of this number 20% said hardly ever, 27% said sometimes, and 20% said often. The study also pointed out that in 2017 social media news use increased among older, nonwhite, and less educated Americans. 78% of people between the ages of 18-49 used social media as a source of news while 55% of 50+ used it as a source. 74% of nonwhite persons used social media as a source of news while 65% of white persons used it as a source. 69% of American with some college or less used social media as a source of news while 63% of Americans with a college degree used it as a source. How to Keep Abreast of the Latest News Online? If you live in the Phoenix region, you no doubt use the internet to source your news. There’s a lot going on today, from local news to international news, and the internet is a great way to keep up-to-date. But when the internet is slow or the quality has decreased due to the end of net neutrality, it can be frustrating. And you don’t need any more frustration in your life. At Phoenix Internet, we make your internet news viewing as seamless as possible. We offer high-speed internet with 99.999% guaranteed uptime and no limits on data. We are here to serve you and your internet needs in the greater Phoenix metropolitan area. If you are wanting to stay alert to all the latest news, then Phoenix Internet will help you do that. 43% of all Americans get their news online from multiple sources — most news sites and other sites. Two-thirds of all U.S. adults get some or all of their news from social media forums. Phoenix Internet helps you maintain a reliable, fast internet service so you never go without your news updates. 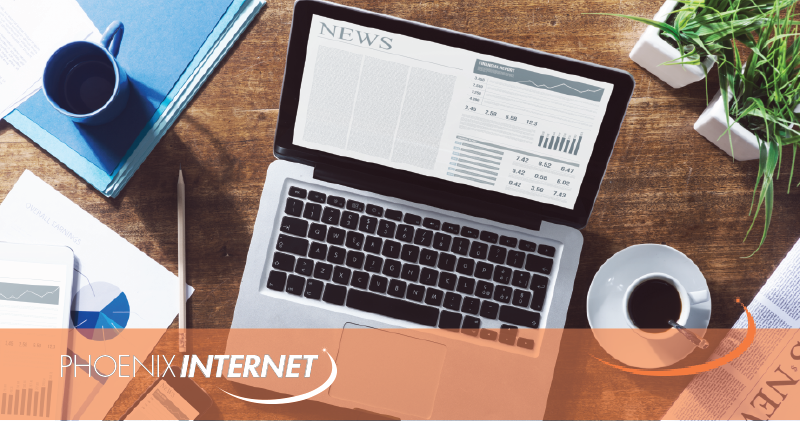 For your Internet service, contact Phoenix Internet today to learn more about how we are a step above the rest of the competition… and that’s news you can bet on.